My weight has been my biggest struggle since I had my first child in 1996. It felt like I could never get a handle on it. I have tried every kind of diet plan that was on the market. I have had personal trainers, gym membership, and designed workout plans that would help for a little while. I just could never keep the weigh off permanently. It would always come back after a while with a few extra pounds. I was constantly frustrated and depressed about my appearance and the way it made me feel inside. Shopping was my worst nightmare. I had lost all my confidence and did not want to be around family and friends due to the way I looked. I hated doing activities because I was out of breath all the time. BeLiteWeight has changed my life in more ways than i could ever realized. I love trying on clothes and looking in the mirror thinking wow this is really me. I love the new me. I finally have confidence and it feels great. I feel like I can things that in the past with my weight I was unable to do. Dr. Elmo Armburo and his team at BeLiteWeight has help make these things possible. I loved the staff and the facilities are amazing. When I first walked in and saw the room I would be in, I was in shock. It was like a spa. It was above my expectations. The staff and doctors went over and above to take care of me and make sure all my needs were met. My experience was amazing and I am VERY satisfied with my results. It has been almost 5 months since my surgery. I started out at 195 lbs and am almost down 50 lbs. * I enjoy waking up every morning and picking out my clothes, where this use to be the most dreadful thing for me. I love my confidence level and that I have a totally new attitude about the new me. BeLiteWeight has changed my life. I now live a healthy life that I am proud of. Things that I have lost I have found again. The only regret I have is not have the sleeve done years ago. Thank you BeLiteWeight, Dr. Elmo and staff for the person I am today. 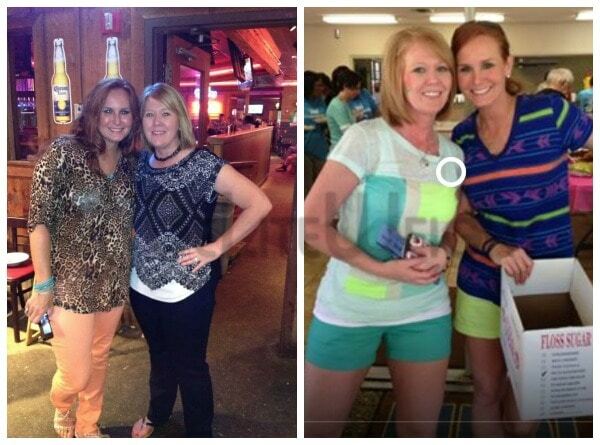 The before and after photos are of my friend Brandy and myself. We had surgery on the same day (I have blond hair).